Marvel has been on a roll in recent years. Okay, so I suppose one could say they’ve been on a roll since the Marvel Cinematic Universe began with Iron Man ten-years ago(!). Sure, there have still been a few stinkers here and there (even within said Cinematic Universe), but for the most part, the MCU – despite its seemingly constant stream of releases – has been pretty consistent. That’s been especially true of the past few years. As Marvel builds up to the first part of its crescendo with The Avengers: Infinity War, they’ve been releasing some exceptionally entertaining features, such as Guardians of the Galaxy: Volume 2, Spider-Man: Homecoming, and the franchise reviving Thor: Ragnarok. The latest of these releases is Black Panther, Marvel’s last film before Infinity War hits theaters. Black Panther manages to match Marvel’s recent winning streak and – with the possible exception of Homecoming – manages to surpass them in the story and character department. Taking place shortly after the events of Captain America: Civil War, Black Panther sees T’Challa (Chadwick Boseman) ready to take the throne of the African nation of Wakanda; after his father, the king, was killed during the events of Civil War. Wakanda is secretly a highly advanced nation due to its abundance of a substance known as Vibranium, which has allowed Wakanda to remain hidden from the rest of the world, posing as a third world country. Of course, Wakanda is also the most “Marvel” country that Marvel could have concocted, given that its king also serves as a super hero known as the Black Panther, given superhuman speed and strength from a “heart-shaped flower” during a ceremony, and wearing a Vibranium suit that adds to his abilities. Like the best Marvel movies, Black Panther takes a premise that may sound silly on paper (super king! ), and turns it into a genuinely good story due to its characters and storytelling. T’Challa proves to be one of Marvel’s more fleshed-out heroes, and is given more inner drama to deal with as the film goes on, which is a nice change of pace (not to mention Boseman’s acting helps elevate the character all the further). T’Challa is nicely countered by one of the MCU’s better villains in Erik “Killmonger” Stevens (Michael B. Jordan), a vicious soldier who has allied himself with Ulysses Klaue (Andy Serkis), a black market arms dealer who has been stealing Vibranium for decades. What sets Killmonger apart from the vast majority of MCU villains is an actual sense of motivation which – although not the first MCU foe to boast such an element (Have we already forgotten Vulture?) – gives him a sense of depth that this mega-franchise has often struggled with in regards to its baddies. It’s the fleshed-out hero and villain, and the dynamic between the two that – like Spider-Man: Homecoming – helps elevate Black Panther to being a more character driven narrative than most of its super hero kin. The film also squeezes in some social and ethical commentary that comes into play between hero and foe (Killmonger has a very understandable chip on his shoulder in regards to Wakanda hoarding its technological advancements for itself in secret, when they could easily help the rest of the African continent, and the world, with it). If there are any troubles to be had with the film’s plot, it’s that the very nature of Vibranium can come across as an overly convenient device all too often. With how frequently it seems Wakandan technology can just do anything, it can seem like an easy means to get the story from point A to point B without having to give things much thought. Vibranium can come across as more of a magic element than Dr. Strange’s actual magic at times. Still, Black Panther has a lot going for it, including some memorable supporting characters (and performances) such as T’Challa’s semi-love interest Nakia (Lupita Nyong’o), and his genius inventor younger sister Shuri (Letita Wright); not to mention an almost-surprisingly good musical score that fittingly blends African inspirations with traditional super hero/science-fiction sounds. Other highlights include the film’s state-of-the-art visual effects and highly entertaining action set pieces, both categories being at the top of their game within the MCU. Black Panther ultimately proves to not only be an exceptional good time at the movies, but one of the best films within Marvel’s Cinematic Universe. It does still fall prey to some of the franchise’s convenient plot devices (seriously, what can’t Vibranium do? ), but like Spider-Man: Homecoming, its emphasis on character arcs and development helps elevate it above most of Marvel’s (admittedly enjoyable) output. It may not completely reinvent the super hero genre in the way films like Spider-Man 2, The Dark Knight and The Incredibles did way back when. 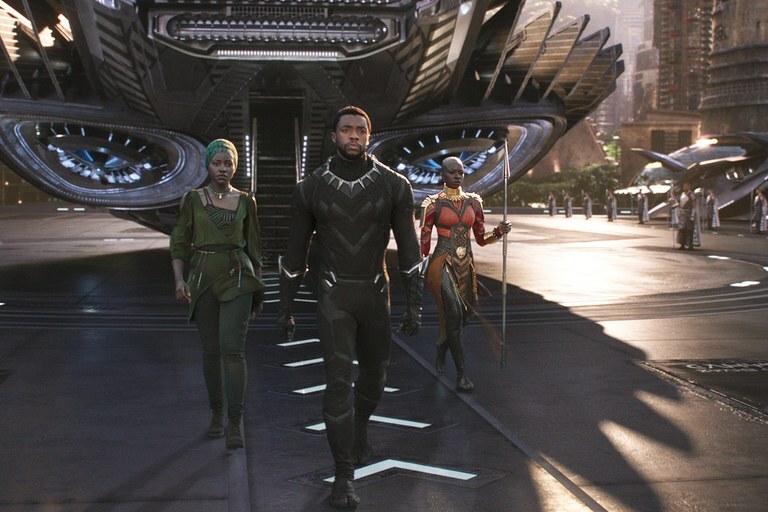 But in a time when the genre can feel oversaturated to the point that even its more hyped releases begin to blur with each other, Black Panther helps reinvigorate the super hero film through its solid execution, unique setting and aesthetics, and character depth. Scrumptious review !! Keep it up !